But when their mission is betrayed from the inside, Cassie will be forced to place her life in the hands of the one man who's anything but trustworthy. 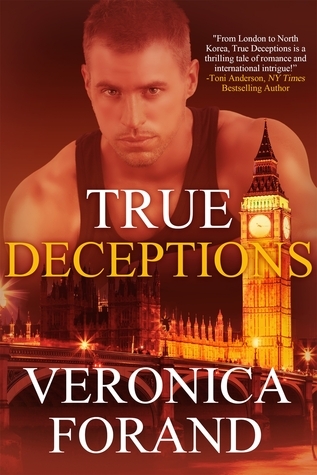 True Deceptions is the sequel to Untrue Colors also reviewed here. Alex and Henry from 'Untrue Colors' make a welcome appearance in 'True Deceptions' and we get an update on their relationship. True Deceptions is Simon's story. An MI6 agent who suddenly finds himself on a mission with a beautiful but inept partner. Cassie is an expert in robotics and her expertise is needed for this mission, however, she has no survival skills. This infuriates Simon. His former partner was exceptionally skilled but killed during his last mission. He believes the untrained Cassie will make his current mission more dangerous and get them both killed. In the beginning of the story Simon is quite unlikeable as he doesn't treat Cassie with an ounce of respect. Despite their mutual mistrust and dislike for each other, they fall into bed together very quickly. That aspect of their relationship and character development seemed too rushed for me. The more they flirted and got to know one another, Simon became less grouchy and more likeable and Cassie, the classic damsel in distress, gained confidence. The suspense kicked up several notches as the story progressed and I couldn't put it down. Of course, the mission doesn't go according to plan and Simon and Cassie find themselves in several sticky situations. There was a lot going on with different characters making appearances and having their own murky agendas. The plot is intricately woven and I found that I needed to pay attention. Highly recommended to all romantic suspense fans. If you haven't read Untrue Colors I'd recommend beginning with it for full enjoyment although True Deceptions can easily be read as a stand alone novel. 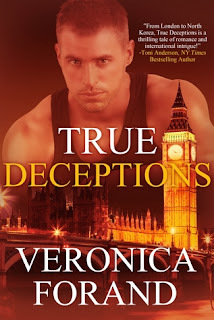 I received an ARC of True Deceptions from Entangled Publishing via Netgalley in exchange for an honest review.